Реконструкция "родового гнезда", где родилась и выросла хозяйка квартиры в современное жилье для молодой семьи. 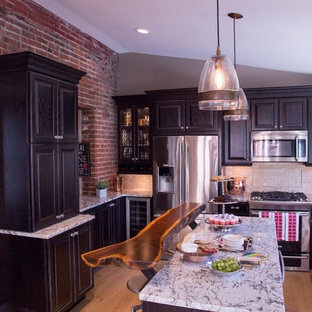 A brick wall, original to this 100 plus year-old house, forms the backdrop for this kitchen packed with unique design features. Espresso stained wood cabinetry has contrasting tops of Giallo Argento granite and a stunning upper island top of live edged walnut wood. The pass-through bar has a special holder for chilling a bottle of wine. 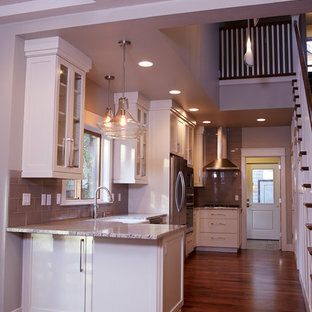 New wood floors of 6 inch wide white oak planks warm up the stainless appliances and stainless farm sink. 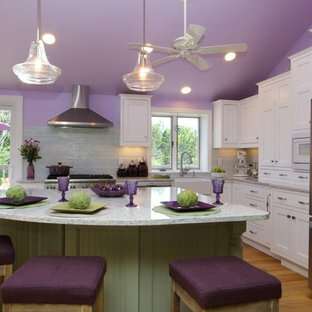 The shiny glass island pendant lighting and crystal accented hardware add a nice touch of sparkle to this charming space. 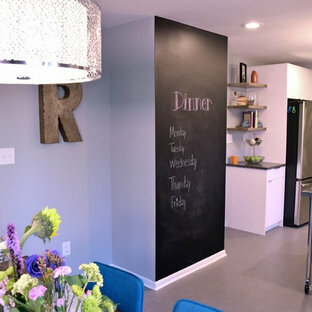 Chalkboard wall foreground with dinner menu planning, white cabs in the background. 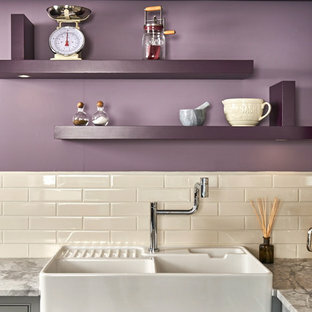 By Lewis Alderson & Co.
High Gloss Aubergine and White fronts, with a Stainless Steel Shutter Unit. 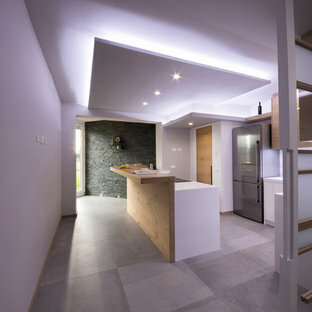 Concealed lights under the worktop edge. 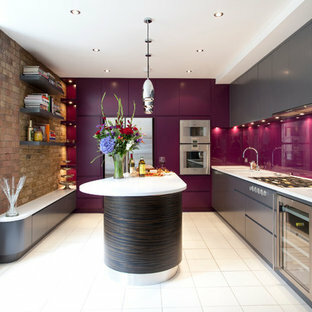 This kitchen was originally created in the early 70's, and was very dated. We gutted it, taking out the old dark wood cabinets and grouted tile, and re-did the kitchen with all white cabinets and a few glass fronts. 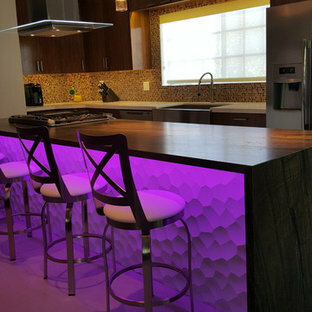 We also added a beautiful terrazzo countertop made with concrete and glass, with a touch of glow in the dark aggregate to give it a glow at night.